7" long Diamond Essence Designer Bracelet with 1.25 Cts. each Oval cut Ruby Essence and Round Diamond Essence Stones. Appx. 27.0 Cts. T.W. set in14K white gold. 7" long Diamond Essence Designer Bracelet with 1.25 cts. each Oval cut Ruby Essence and Round Diamond Essence Stones. Appx. 27 Cts. T.W. set in 14K White gold. 7" long Diamond Essence Designer Bracelet with 1.25 Cts. each Oval cut Ruby Essence and Round Brilliant Diamond Essence Stones. Appx. 27.0 Cts. T.W. set in 14K White gold. Diamond Essence Designer Bracelet with 1.25 cts. each Oval cut Ruby Essence and Round Diamond Essence Stones. Appx. 27 Cts. T.W. set in 14K White gold. 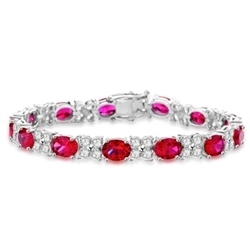 Diamond Essence Designer Bracelet with 1.25 Cts. each Oval cut Ruby Essence and Round Diamond Essence Stones. Appx. 27.0 Cts. T.W. set in 14K White Gold.